TheMReport — News and strategies for the evolving mortgage marketplace. TH E M R EP O RT | 41 O R I G I NAT I O N S E R V I C I N G DATA G O V E R N M E N T S E C O N DA R Y M A R K E T ORIGINATION THE LATEST Underwriting Standards Loosen for Fourth Straight Year OCC survey shows banks and savings associations relaxed credit standards yet again in 2016. T he vast number of poorly underwritten mortgage loans leading up to the crisis caused banks to tighten up their stan - dards and generally make loans only to those borrowers with pristine credit. In the last few years, however, those tight post- crisis underwriting standards put in place by banks are begin- ning to relax a bit. The Office of the Comptroller of the Currency's 22nd Annual Survey of Credit Underwriting Practices, released December 20, found that underwriting standards had relaxed for banks and federal savings associations for the fourth consecutive year. Much like in 2015, residential real estate loans, conventional home equity, commercial real estate loans, and direct consumer loans were among the areas that experienced the greatest amount of change, according to the OCC. The survey covered the 12-month period ending June 30, 2016 and covers aggregate total assets of $10.2 trillion and $5.2 tril- lion in gross loans—approximately 90 percent of the loans in the federal banking system (across 93 national banks and federal savings associations), the OCC reported. "During the 12-month survey period, underwriting practices remained satisfactory," said Grace Dailey, Senior Deputy Comptroller and Chief National Bank Examiner. "But an increasing toler- ance for looser underwriting has resulted in a continued movement from more conservative to more moderate underwriting practices. While this movement is consistent with past credit cycles at a similar stage, credit risk is expected to increase if the trends we see today continue." 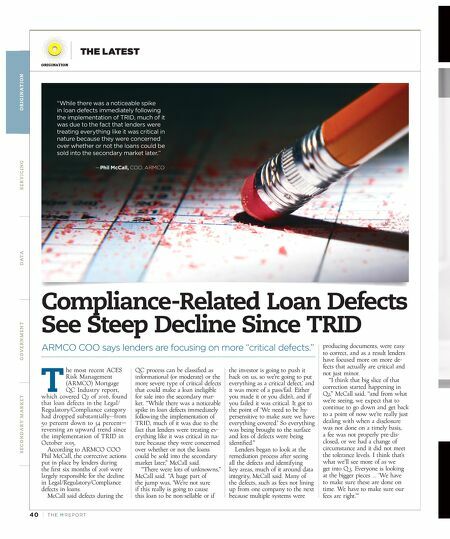 According to the OCC, the easing underwriting standards indicate that banks have a greater risk appetite and a greater desire for loan growth. "Examiners reported that the leading reasons for eased under- writing practices since the 2015 survey are increased competi- tion, higher credit risk appetites, and perceived improvements in general economic conditions," the report stated. "Banks generally tighten underwriting practices when the economy contracts and ease underwriting practices when the economy expands. Since 2012, examiners have cited these rea- sons, along with the existence of abundant market liquidity, for the eased underwriting practices." Refinanceable Population Drops More than 50 Percent Only 3.3 million homeowners are eligible for refinancing with current mortgage rates. E arly in December, Black Knight Financial Ser- vices reported that the rise in mortgage rates had reduced the refinanceable popula- tion—the number of borrowers who are likely to benefit from, and qualify for, a mortgage refinance— by more than half, from 8.3 million down to 4 million. With Freddie Mac reporting for the week ending December 8 that the average 30-year FRM had increased another 5 basis points up to 4.13 percent, the highest point in 2016, Black Knight reported later in the month that the refinanceable population had been reduced by another 700,000 borrowers down to approximately 3.3 million. According to Black Knight, only twice in recent history has the refinanceable population been this low—in the back-to-back months of December 2013 and January 2014. In Q1 2014, refi volume fell to its lowest point in a decade and was 60 percent lower than the refi volume in Q 3 2016, the most recent quarter for data available, according to Black Knight. "In a nutshell, rate/term refis will likely fade away if rates continue to rise," Black Knight EVP Ben Graboske told MReport. "The last time we saw the refinanceable population this low, refi origination volume fell to about 55 percent be - low what it was in Q 3 2016, so we may be looking at a sharp drop-off in the months ahead." Graboske continued, "We'll also likely see cash-out refis make up the majority of refinance origina - tions for the first time since 2008. Cash-outs were already making up over 40 percent of the refi market prior to the rate increases, and that share is likely to jump as rate/term refis fall out of the market. In fact, there's noticeable burnout in the re - financeable population, which sug- gests we may actually see volumes drop more than 55 percent this time around, since many borrowers with the interest and incentive to refinance have already done so." Freddie Mac Chief Economist Sean Becketti noted in early December at the time that the rates jumped above 4 percent that "With mortgage rates at the highest we've seen this year, bor - rowers are now backpedaling on refinance opportunities." Graboske said in the company's October 2016 Mortgage Monitor that the decline in refi volume could potentially affect mortgage performance. "Since higher interest rates tend to reduce the refinance share of the market—specifically in higher credit segments—which typically out - perform their purchase mortgage counterparts, they may potentially impact overall mortgage perfor- mance as well," Graboske said. Zillow Group VP of Mortgages Erin Lantz advised buyers to hang in there, though. "Consumers considering buying or refinancing now should stay pa - tient," she said, "as we'll likely see rates stabilize once markets find a new equilibrium." 2017 | © Old Republic Title | Old Republic Title's underwriters are Old Republic National Title Insurance Company and American Guaranty Title Insurance Company oldrepublictitle.com Title Insurance | Real Estate and Mortgage Loan Settlement Services | National Commercial Title Services Mortgage Servicing Solutions | Default Management Services | Real Estate Information Services Real Estate Valuation Services | Flood Reports | Section 1031 Exchanges | Notary Services Nationwide Commercial Due Diligence Services | Nationwide Commercial Survey Services Relocation Services | Timeshare/Fractional Interest Services | Residential Information Services Meet Matt. Pianist, watch maker, second-generation title insurance professional, Agency Manager for Old Republic Title. Raised in a close-knit family, Matt attributes his work ethic to his family's philosophy that "anything worth doing is worth doing right!" That's how he approaches everything in life … with precision. Whether he's creating music, assembling intricate pieces of a watch or working closely with title agents… it's attention to detail that makes Matt tick. Matt has worked for the Company for nearly a decade, in one of Old Republic Title's most agent-focused regions of the country. He never stops. He supports agents by providing them with the latest tools to help them successfully thrive and grow their business; such as training, education, and resources to quickly address and handle their underwriting needs at the local level... that's doing business the right way. 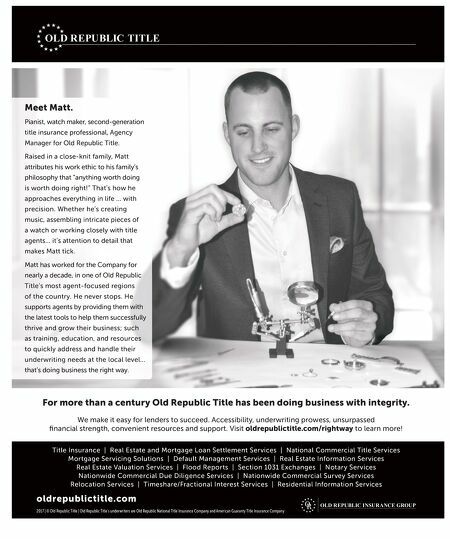 For more than a century Old Republic Title has been doing business with integrity. We make it easy for lenders to succeed. Accessibility, underwriting prowess, unsurpassed fi nancial strength, convenient resources and support. Visit oldrepublictitle.com/rightway to learn more!